Part traditional biopic and part heart-breaking study of repressed homosexuality, J. Edgar is not without its flaws but remains worth watching thanks to a terrific central performance from DiCaprio and strong support from Armie Hammer. 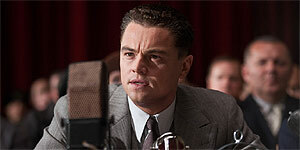 Directed by Clint Eastwood and written by Dustin Lance Black (Milk), J. Edgar stars Leonardo DiCaprio as J.Edgar Hoover, who became director of the Federal Bureau of Investigation aged just 29 and remained in power until his death in 1972, eight US Presidents later. Set predominantly in the 1930s and the 1960s (with Hoover dictating his memoirs and preparing to bug Martin Luther King), the film traces Hoover's career and his relationships with loyal secretary Helen Gandy (Naomi Watts), his mother Anna Marie (Judi Dench) and his right-hand man and the presumed – unconsummated - love of his life, Clyde Tolson (Armie Hammer). DiCaprio is superb as Hoover, portraying him as a man obsessed with proper order and compartmentalisation – this facet of his personality was instrumental in transforming the FBI (Hoover was responsible for instigating a nationwide database of fingerprints, among other things) but it also enabled him to continually box off and deny his true feelings for Clyde (at least, according to Black's script). Hammer is equally good as Clyde and there's genuine – albeit deeply repressed – chemistry between the two men, while Dench is cast against type to chilling effect as J. Edgar's homosexual-hating mother (“I'd rather have a dead son than a live daffodil!”). At its heart, J. Edgar has more in common with Brokeback Mountain than it does with, say, Oliver Stone's Nixon, as it's essentially a heart-breaking study of repressed homosexuality masquerading as a traditional biopic (something the trailer manages to keep entirely under wraps). The main problem is that, despite the flashback-enabling memoirs conceit, the structure feels messy and the two elements never really gel together, while the script leaves too many unanswered questions (such as the exact nature of Hoover's relationship with Helen) and frequently lacks clarity - it doesn't help that the script then suggests Hoover is an unreliable narrator, although it refuses to explore that idea. On top of that, the old-age prosthetic work on Armie Hammer is truly appalling and extremely distracting (DiCaprio's is just about convincing), while Hammer's doddery geriatric acting is a little over the top and borderline laughable. Similarly, the script frustratingly under-uses both Watts and Dench, which is a curious decision given their obvious importance in Hoover's life. Despite its flaws and an overly long running time, J. Edgar is an engaging and surprisingly moving drama thanks to a terrific central performance from Leonardo DiCaprio. Worth seeing.